John Lott, Senior Director, left, and Dr. Darinka Mileusnic-Polchan, center, Chief Medical Examiner for Anderson and Knox counties, discuss results from the 2016 Drug Death Report with Anderson County Mayor Terry Frank. CLINTON, TN—Anderson County Mayor Terry Frank has reviewed the Knox County Regional Forensic Center Drug Related Death Report 2016 for Knox and Anderson counties with Senior Director John Lott and Dr. Darinka Mileusnic-Polchan, Chief Medical Examiner for Knox and Anderson Counties. Overall, the report notes an upward trend of drug-related death cases and the number and types of drugs associated with drug-related deaths. “In reviewing the report with Mr. Lott and Dr. Mileusnic-Polchan, the most alarming discussion point was their estimate of Drug Deaths for our year ending December 31, 2017. In 2016, there were 32 Drug Related Deaths in Anderson County, an increase of 7-percent compared to 2015. As of August 7, we are at 24, and their estimates for year-end are 42 Drug-Related Deaths. This loss of life itself is extremely saddening, not to mention the pain and suffering each loss brings to family, friends and the community,” said Mayor Frank. 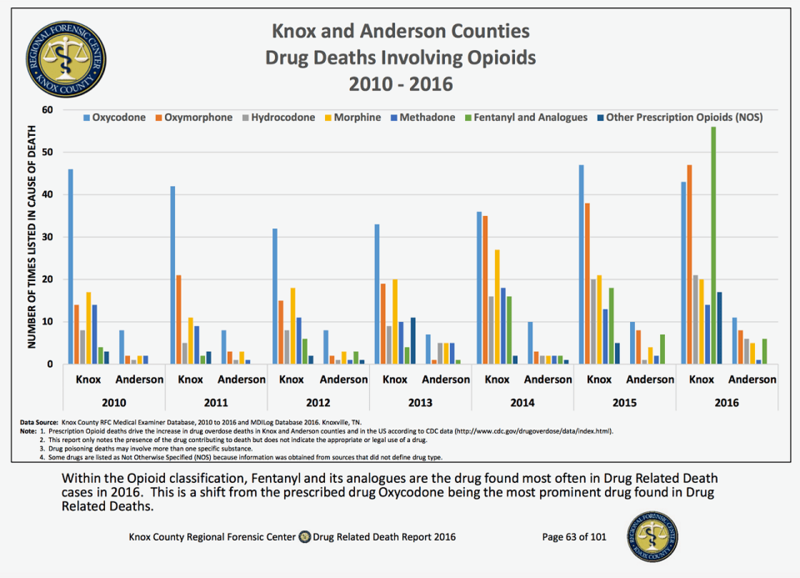 Released on Thursday, September 7th, the 101-page report outlines several key highlights for the Knox/Anderson County area such as: though most drug-related deaths still occur in the 45-54 year old age group, in 2016, in Anderson County there was a 100% increase in the 25-34 year old age group and a 200% increase in the 65-74 year old age group; in 2016, data shows more drugs involved in Drug Related Death cases in addition to an increase in illicit drugs found in Drug Related Deaths; and Fentanyl and its analogues are the most frequently found drug in Drug Related deaths for 2016. “When we examine Anderson County specific data, we see we are seeing a shift to the 25-34 and 55-64 year-age groups. We are also seeing a shift from Prescription Drugs being the predominant drug of choice to Illicit Drugs. In Anderson County, Oxycodone remains the most prevalent drug found in Drug Related Deaths; however, we are seeing an uptick in the appearance of other drugs including cocaine, methamphetamine, morphine, hydrocodone and heroin,” said Mayor Frank. “As a community, we must continue our efforts at education and prevention, awareness, and coordination with key agencies and organizations to combat this epidemic,” said Mayor Frank.